The BushMan water resistant insect repellent (hereafter referred to as Bushman or repellent) comes in a plastic squeeze tube that is roughly 1.75 in (4.45 cm) in diameter and is 4.75 in (12.1 cm) long. The tube is tan in color with red lettering and a red plastic cap. The front label claims that it repels "sandflies, mosquitoes, ticks, leeches (a new one for me) and marchflies". It uses DEET (Deithlytoluamide) as its main ingredient and contains 80% of it. The front label has the manufactures claim that it, "Repels for hours in areas of intense insect activity". 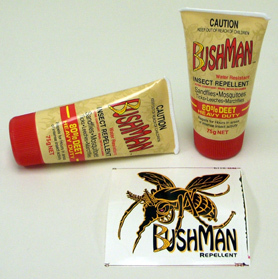 I have been carrying the Bushman repellent since late spring of 2008. It has been along with me on hikes along the Pacific Crest Trail in California to the tune of about 100 miles (160 km) and another 30 miles (48 km) in Minnesota and some early spring trips in the mountains. The sweat proof claim has been tested in temps up to 90 F (32 C) with some major sweating going on as I was climbing hard. The BushMan repellent does not smell bad. It is not perfumey, but smells like hand soap to me. It does not leave an oily finish as long either. It does feel oily at first, but soaks into my skin and dries fairly fast. It is very water resistant. In fact it is hard to get off in my experience. Even after washing with soap after I get home I can still smell it on my skin. It is sweat-proof too. As much of the use in California was in desert conditions I was sweating quite hard shortly after starting the hikes. The BushMan stayed put quite well and kept on protecting. It works very well. I have one instance of a day-hike that explains my feelings as to the usefulness of the BushMan that I will relate here. On a day hike outside of Moorhead Minnesota, a state known for their 200+ species of mosquitoes, I was repeating a hike that I had taken the day before as I was using the 10 mile 16 km) course to check accuracy of an accelerometer. The previous day had been cool and cloudy and the next day looked to be the same way. But one mile (2 km) into my hike the clouds broke and the temperature quickly climbed. I went back home and applied the BushMan to every bit of my exposed skin. I then rubbed some on my hair as I was not using a hat. Then I drove back to the point that I had to turn around and went forth to do battle. I watched cloud after cloud of mosquitoes come out to get me. They were in such high concentrations that they cast a shadow I could see in front of me as I walked. But they did not land. They wanted to. I had to make a concerted effort not to focus on all of them flying in front of my face. When little puffs of wind would blow I could feel the mosquitoes pushed into my arms and face, but they did not land. I never got a single bite even though I was surrounded by hundreds (maybe more) of the frustrated little suckers. I wished so much that I had someone with me to take a picture. I also used the BushMan at my son's Little League games in Minnesota. The grass and trees at the parks are full of mosquitoes and the BushMan kept me skeeter free. In California it worked well on mosquitoes, gnats and our aggressive and hard biting deer flies. It goes a long ways too. I still have quite a bit in both tubes (one in Minnesota the other in California). In fact the only recommendation I have for BushMan is to maybe make a smaller size for weight and space conscious ultra-light and light-weight backpackers. I have not had any problem with it affecting any of my synthetic materials but am pretty careful where I get any DEET based product after learning some hard lessons in the past. All in all I am pretty impressed with the BushMan product and will not hesitate to purchase it if it becomes available in the United States.